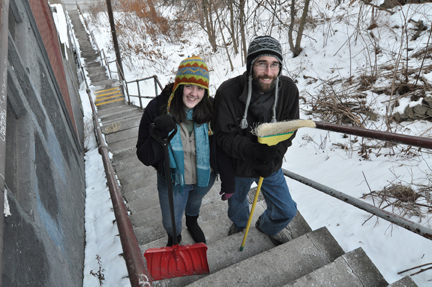 The Polish Hill Stair Stewards program was created to keep our City steps clear of ice and snow. The agreement with the City is that if we can find a neighborhood volunteer to assume stewardship of a set of city steps, City crews will provide a salt box at the site and keep it filled. Currently, four sets of City steps in Polish Hill have stair stewards: Fleetwood, Harding, Apollo, and at the monument. But the two most-used sets of City steps, Dobson-Herron and Downing-Herron, don’t currently have stewards after their former caretakers moved away. So we’re putting out the call. If someone who lives near either of these steps wants to help make the neighborhood safer for pedestrians, and has the energy to climb and shovel, please get in touch. Call 412.681.1950, or email us. … and snows and snows and snows. Sort of like that Bunny with a drum, it just keeps snowing and snowing. February has broken snowfall records. We have now set the bar at over 40″, and we still have another day to go to finish out the month and it’s still snowing. But we have some heroes on our side during the 2010 Snowpocalypse, neighbors that have gone above and beyond. Clearing accumulation from the Monument on Brereton so that pedestrians could walk around the corner without needing to enter the street. 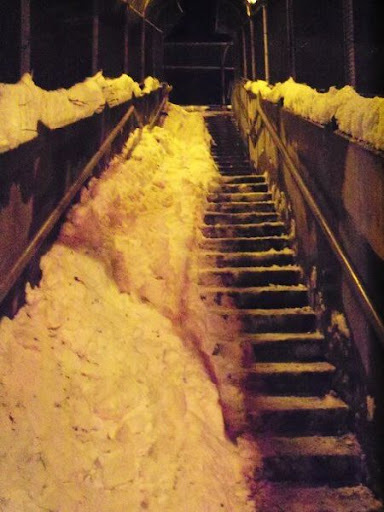 Pathways were cut through two separate snow piles blocking the staircase on upper Brereton. Cleared the sidewalk on upper Brereton above the steps to the corner of Herron. Cleared half the distance between Brereton and Phelan. Cleared the Herron Bridge to Liberty Ave.
Cleared the pedestrian walkway over Bigelow Blvd. Unfortunately, the City sidewalk crew was unable to perform. Walkability in the neighborhood of Polish Hill is improving by leaps and bounds. Not because of melting snow but because of the work of several volunteers. These individuals have taken shovels into their own hands and tackled staircases, publicly-owned sidewalks and intersections. 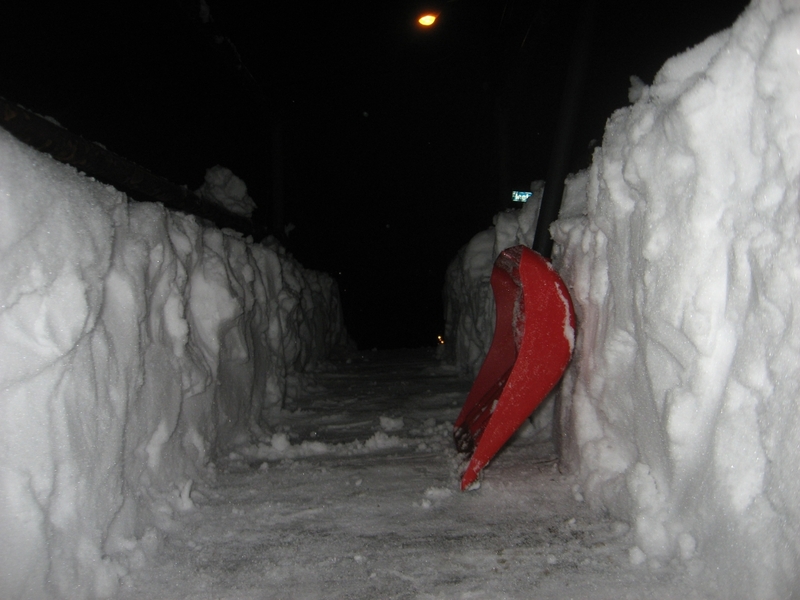 Patrick Singleton and Jennifer Kirk have been putting hours in every evening to clear paths on the staircases. The above is a picture of the Harding staircase that they were clearing last night. Josie Ramsey has been working to clear the sidewalk on Paulowna, between Herron and 30th St. Many children use this route on their way to and from the West Penn Recreation Center. With clearer streets comes additional danger to pedestrians. Cars are picking up speed, but there is still no place for the children to walk, forcing them out onto the street. Josie is doing what she can to safeguard our children. Hats off to PHCA’s intrepid President, Terry Doloughty. With his snowblower, he has been able to increase the safety of pedestrians in the neighborhood. Among the many snow removal projects that he has undertaken, Mr. Doloughty is responsible for clearing the path on Brereton between 30th St. and the 28th St. bridge. He even cleared a fallen tree from the sidewalk and the bridge is now passable on foot. [EDIT] To give credit where credit is due — Leslie Clague and Myra Falisz are responsible for clearing the snow from around the monuments. Mr. Dolughty mentioned that they both helped out clearing a path down to the 28th St. bridge. I am sure that many others are out there doing the same. I also know that these individuals plan on tackling additional snow removal issues tonight. If you can, lend them a hand. Patrick and Jennifer will be working on clearing intersections for pedestrian safety. Terry is trying to come up with a solution for the bridges. If you want to help, just grab your shovel and start moving snow! Many, many thanks to all of you. This is what makes Polish Hill such a wonderful community; it really is a community. Downing to Herron Staircase has re-opened! Well, we have our staircase back! The Downing to Herron staircase has re-opened. So for all of you folks that have been taking the long way around, this will be great news! For all of you crazy people that were using the staircase even when the landing was missing and the staircase was barricaded and there was yellow caution tape everywhere, I’m so glad none of you broke your necks. Really. It was such a nice day for the re-opening too! Sunny, but not too warm. Perfect for a sweat-free climb to the top of the staircase. Look at that landing! So, we’ll see you on the staircases! On my way to the Polish Hil Civic Assoc. this morning, I soptted a crew working on the Downing to Herron staircase. There has been some activity lately, as you all may have noticed. A central pillar support was added last week for the missing landing, and the corner supports have been reinforced. The crew that was there today had just finished pouring the landing. They told me that the railing would go back in at the beginning of next week. The upshot of it is that we should have the Downing to Herron staircase re-opened for use, possibly as early as Tuesday and definitely by Wednesday. With spring feeling like it is just around the corner, it is difficult to think ahead to next winter. Just keep in mind that the city is thinking about a new winter program that will hopefully be in place for next winter. Staircase stewards would take on, as volunteers, salting the public staircases to keep them passable during winter months. We’ll keep you updated on this, but if you use the staircases, please consider becoming a steward. As many of you know, the city staircase between Downing and Herron was closed last week. 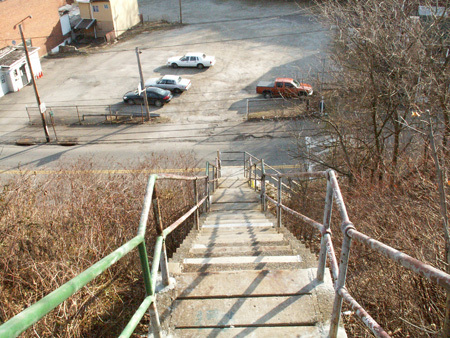 The Polish Hill Civic Association has been in touch with our city officials, stressing how important these steps are. The steps will be repaired, but it may be some time. This is due to weather conditions since concrete won’t set under 40 degrees. We will keep you up on any developments and will definitely let you know when the staircase has been repaired. See you on the steps. As many of you may have noticed, the Downing to Herron staircase has been closed. The staircase was closed on Thursday night. The supports on the Herron Ave entrance deteriorated further since this image was taken. 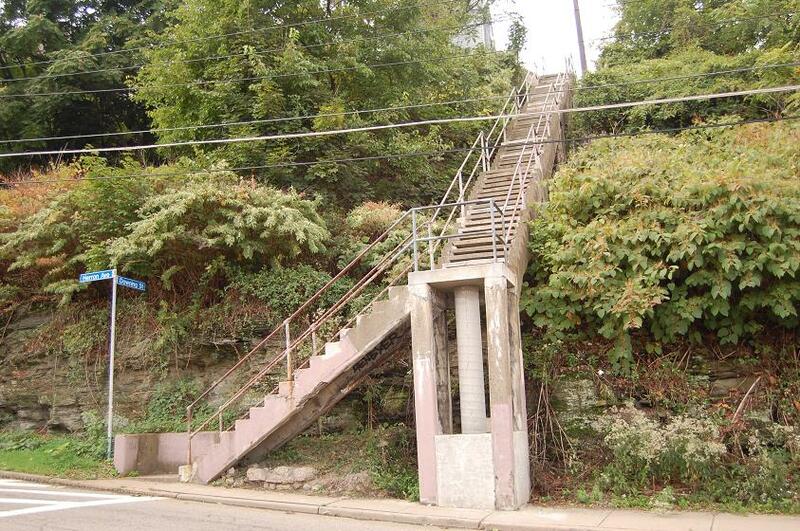 Many of the residents here in Polish Hill use this staircase to get to the busway and to Liberty Avenue. The alternative staircase, Dobson to Herron, is still open. It has been noted that the third landing from the bottom experiences degrees of flooding during rain and snow melts, so please be aware of this when you take the stairs. 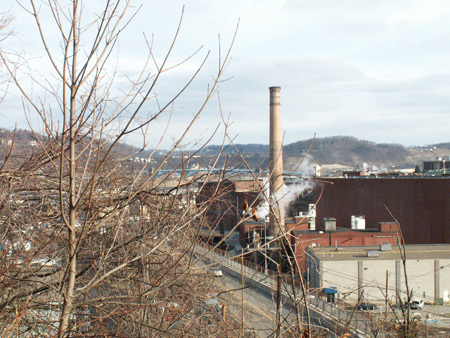 The Polish hill Civic Association will post developments as they arise. See you on the staircases!